A special 3-screen program from CVM featuring Scott Draves' Generation 244, plus work by Robert Seidel, Baerbel Neubauer, Christina McPhee, Maura McDonnell and Charles Dockum. Curated by Cindy Keefer. LA County Museum of Art, central plaza, Stark Bar. On view beginning July 28, evenings through January, 2012. Images courtesy Scott Draves and the Electric Sheep. PREVIEW of McPhee's Bird of Paradise video triptych. as Marclay's THE CLOCK 24 hour screening in Bing Theatre...so please join us while taking a break from The CLOCK, as Stark Bar will be open until 2am screening the CVM program. 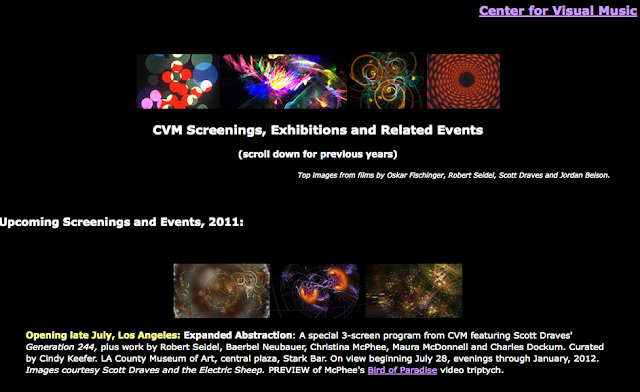 Or come just to see abstract film/digital work curated by CVM.